Kaluokaʻhina: The Enchanted Reef, an animated feature film in 360° fulldome projection format makes its Hawaiʻi debut at the Hōkūlani Imaginarium on Saturday, February 21 at 2 and 3 p.m.
Viewers are transported deep below the ocean’s surface to an enchanted tropical reef hidden from mankind—Kaluokaʻhina. The reef’s colorful inhabitants have always lived in secrecy and peace until a volcanic catastrophe breaks the spell. 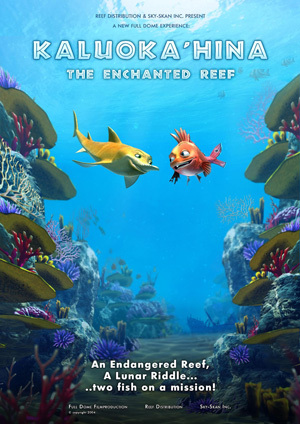 Now it’s up to Jake, a young sawfish and his buddy, Shorty, a lively reef fish to restore the magic of their home. Their only lead is an ancient legend that tells of touching the moon, but how is a fish supposed to touch the moon? The audience travels with Jake and Shorty as they try to unravel the ancient legend and save Kaluokaʻhina. To celebrate the premiere, there will be a special ocean awareness exhibit with activities for keiki presented by the University of Hawaiʻi Center for Microbial Oceanography Research and Education (C-MORE) at the entrance to the Imaginarium from 1 to 4 p.m. Families can learn about fascinating ocean research and exciting careers in oceanography, ecology and microbiology. Call the Hōkūlani Imaginarium at (808) 235-7433 by 4 p.m., Friday, February 20 for early reservations. Seating is limited.